GET A COOL ROOF TODAY. HERE’S WHY! Wondering why white roofs are so popular? Is there a difference between a white roof and a cool roof? Can white roofs really save me money? Let State Contractors, LLC help you answer these questions. A white roof is generally described as a roof with a white surface. They are also associated with a “cool roof” because they reflect heat away from the roof, keeping the interior of the building cooler. White roofs absorb only a fraction of what a dark surfaced roof would absorb, drastically cutting down on your air conditioning usage and costs. It is important to note, that cool roofs do not necessarily need to be white in color. A cool roof is any roof with a reflective surface, the most reflective roof surface is, in fact, a white roof, but you can have a reflective grey, sand, teal, etc… colored roof that also provides reflectivity. A white roof coating system provides an excellent solution to cost savings when you are faced with roof leaks and failures. These systems are applied directly over your existing roof, allowing you to extend your roof life and save 30-50% of the total cost of a traditional roof replacement. The labor for a cool roof system versus a roof replacement is much less and you are able to conduct business as usual, with no noise or odor disruptions and no closures during construction. 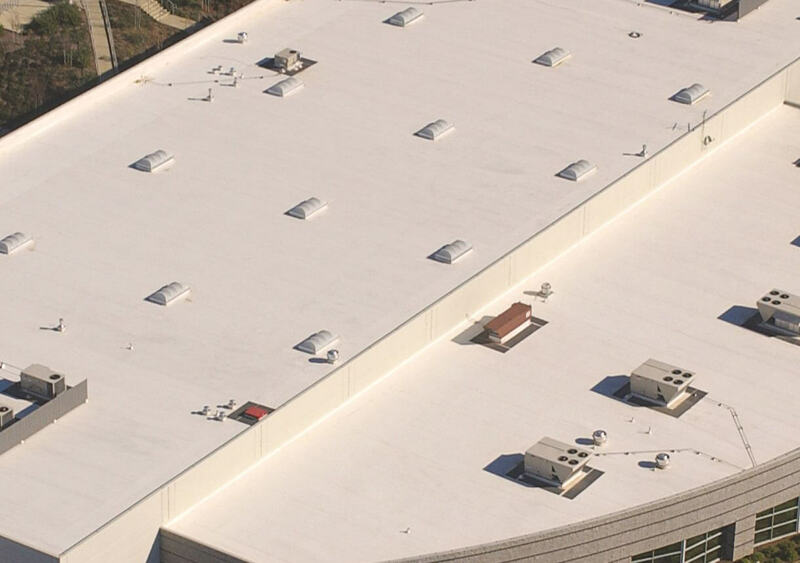 Not only do white roof systems cool your building with its ability to reflect the sun’s heat but it also allows you to extend the lifespan of your roof while lowering your maintenance fees. The sun’s heat is the leading cause of damage and deterioration to a roof’s surface. By reflecting the UV rays away, the white surface is protecting and acting as a barrier against the heat – increasing the service life of your roof. There are several types of cool roofing systems available in the Houston market. The most popular and time–tested is the TPO roof system. The TPO roof system is a single-ply system that allows the new roof system to be installed directly over the existing roof surface. It can also be applied in new construction applications as well, and can be installed on new plywood roof decks or concrete roof decks. Additionally, another great benefit is the TPO roof systems offer warranties up to 20 years covering both labor and materials. Call State Contractors, LLC for a free evaluation of your roof to see if a cool roof best for you!